The party of Zimbabwe's embattled President Robert Mugabe is to begin moves to impeach him. A Zanu-PF official said a motion to strip him of the presidency would be presented to parliament on Tuesday, and the process could take just two days. The motion accuses the 93-year-old of charges including allowing his wife Grace to "usurp constitutional power". Military leaders, who last week intervened, said he will meet his exiled former vice-president soon. Emmerson Mnangagwa fled Zimbabwe after Mr Mugabe stripped him of his position, seen by many as a way clearing the way for his wife to succeed him as leader. The move riled top army officials, who stepped in and put Mr Mugabe under house arrest, though he nominally remains the president. The military said they have planned a "roadmap" with Mr Mugabe for the future. On Sunday, despite intense pressure Mr Mugabe surprised many by refusing to resign, instead in a TV speech vowing to preside over next month's Zanu-PF party congress. 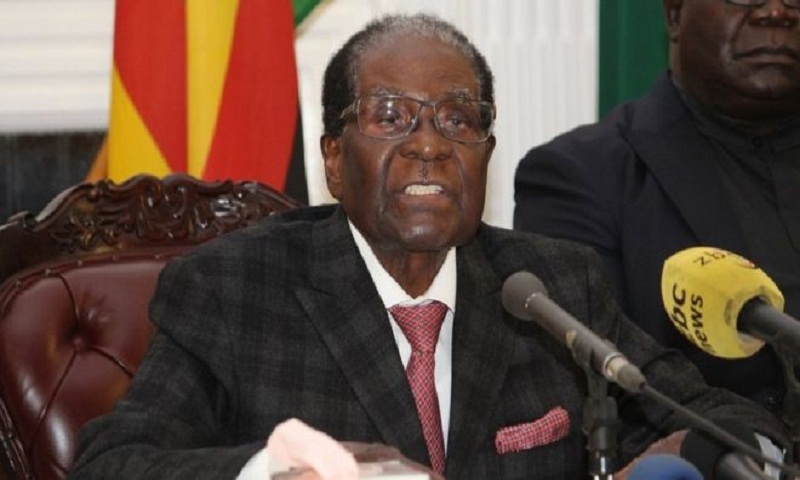 What is President Mugabe accused of? Impeachment proceedings are set to go ahead after a deadline set by the party for Mr Mugabe to stand down came and went. Speaking outside a party meeting on Monday, member of parliament Paul Mangwana said of the president: "He is a stubborn man, he can hear the voices of the people, but is refusing to listen." Impeachment in Zimbabwe can only occur in specific scenarios, on grounds of "serious misconduct", "violation" of the constitution or "failure to obey, uphold or defend" it, or "incapacity". "The main charge is that he has allowed his wife to usurp constitutional power when she has no right to run government. But she is insulting civil servants, the vice president, at public rallies. They are denigrating the army - those are the charges," Mr Mangwana said. "He has refused to implement the constitution of Zimbabwe - particularly we had elections for the provincial councils, but up to now they have not been put into office. He added that the process - which some experts had thought would be lengthy - could be fast-tracked and completed by Wednesday, "because the charges are so clear". Votes are expected to be held in both the National Assembly and the Senate - Zimbabwe's two parliamentary houses - on whether to begin impeachment proceedings. If they pass by a simple majority, a joint committee from both chambers will be appointed to investigate removing the president. Then, if the committee recommends impeachment, the president can then be removed if both houses back it with two-thirds majorities. The opposition has tried and failed to remove Mr Mugabe using this process in the past. But now that the president has lost the support of his own ruling party and its overwhelming majority in both houses, reaching a two-thirds majority is achievable. The vice-president would then take over Mr Mugabe's position. The military, which supports Mr Mnangagwa, would like to see him step into that role. But when he was removed from office, Phelekezela Mphoko - a known supporter of Grace Mugabe - became vice-president, and in theory would assume the presidential role. It is not clear if Mr Mnangagwa could be restored to his former position, and military leaders simply said the public would "be advised on the outcome of talks" between Mr Mugabe and his former deputy.